The curriculum also aligns with the national Licensure Accreditation, Certification, and Education (LACE) model for students seeking preparation as nurse practitioners (NP), clinical nurse specialists (CNS) and nurse midwives (NM). Core elements identify the DNP program as a core program of the SON, all students have the same number of required credits (minimum of 93), and the majority of courses are required of all students. The DNP is conceptualized as a single degree from the SON with multiple specialty tracks organized within the degree. Two major branches of the program identified are the Advanced Practice Registered Nursing (APRN) and Advanced Systems and Population Health (ASPH), each with specific core coursework. The program culminates with a final project that includes an immersion clinical experience during which the final DNP project is completed. Applicants are evaluated for fit with the DNP degree and fit with the specialty track. 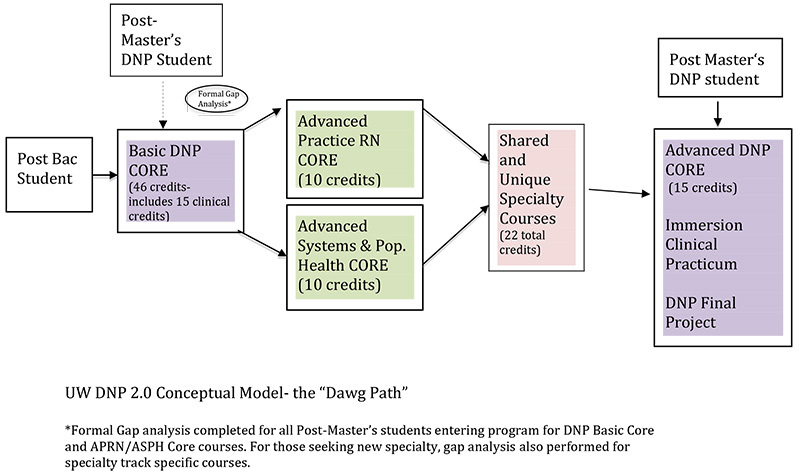 The figure below, which we call the Dawg path, shows the conceptualization of the program, delineating the basic and advanced DNP core, the APRN and ASPH cores, and the shared/ unique specialty courses. The DNP Year 1 core courses focus on the DNP role and foundational content since this is the degree to which all students are admitted. The emphasis is on the commonalities among all the students as learners; however, learning activities in the first year will also introduce students to their specialty track. Beginning the curriculum with DNP Core courses assists students to affirm their interest in and ability to continue in the program before they begin the specialty track training. Specialty Didactic and Clinical Courses include additional coursework necessary to meet certification requirements (if appropriate) for individual specialty tracks. Included in each track are a series of 3 clinical practica courses (a fourth clinical course is included in the final project). The final project includes 2 courses focused on the DNP project and a clinical immersion course. The foundations for the DNP project occur during Year 1 with the series of practice inquiry courses. In the final two quarters of the curriculum, two courses are focused on the DNP final project. The first course is focused on planning practice inquiry and systems level change projects, and the second course is focused on implementation of the project in a clinical setting. The combination of the project implementation course with the clinical immersion course in the final quarter is intended to provide an opportunity for synthesis of advanced practice, practice inquiry, and leadership and also to serve as a transition to advanced practice as a DNP-prepared practitioner. The clinical immersion course consists of 9 credits and the student averages 3 days a week in the clinical setting.